It’s a Revolution, or so I’m being told be Peter Molyneux. Since the original Fable, Lionhead Studios has been touting the Fable franchise as a great RPG experience. 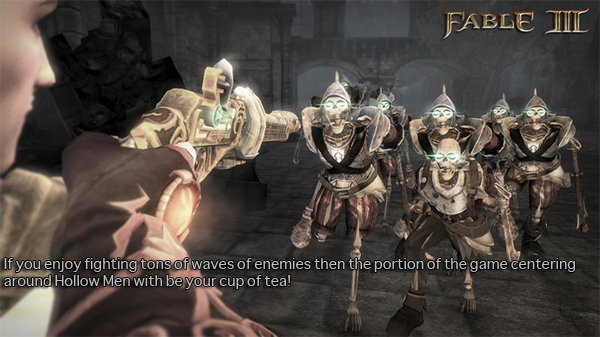 Yet with Fable 3 very little actually RPG elements remain from previous games. Gone is the experience that you collect from fights. Instead the game is much more structured not just in leveling but also in storytelling. Becoming King or Queen of Albion is your ultimate goal, and Fable 3 is more about choice and sacrifice rather then leveling and most of the regular RPG troupes. The reason for your needing a revolution is because your brother is bat crap insane. There really is no other way to but it, your brother is evil and now you need to stop him. You start the game similarly to Fables’ 1 and 2 by selecting your gender. I chose a female character, yet like the previous games this choice doesn’t really get very fleshed out. Your character has little to no personality to speak of, and on the matter of speech your protagonist is very selective on when they voice their opinion. Upon fleeing the Castle for reasons that I wont spoil (though like I said your brother is evil, take that as you will) you learn that you are destined to become a hero…surprise! Throughout the game you are sent to various locations throughout Albion in order to request help from various groups of people. Your trying to acquire an army and they bigger your army the easier it will be to fight your brother, simple enough. At first you are only accompanied by your loyal butler (voiced by John Cleese) and Ser Walter a staunch and loyal bodyguard of sorts. Of course your trusty dog is along for the journey as well, yet there hasn’t been many new additions to make your dog more useful. If you had problems with the dog mechanic in Fable 2 well your out of luck it’s still the same. He fights in combat sometimes or locates treasure, that’s it! Regardless, with this small band of rebels you need to convince each faction of society you meet into joining your cause to become ruler. As you progress in the main story you make promises to the people you meet that you will uphold when you become ruler. These promises you make to the people of Albion throughout your quest become the entire focal point of the later half of the game. 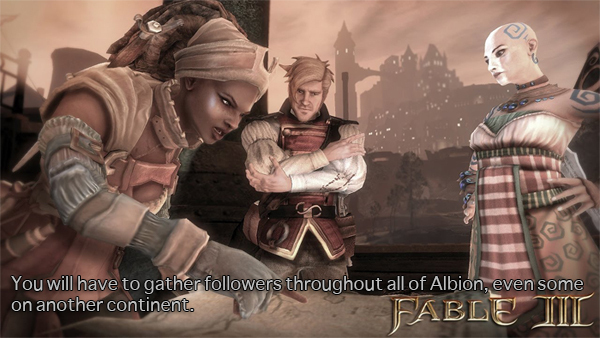 The last half of Fable is a unique concept…unfortunately the first half; the recruitment phase -- is somewhat sallow. 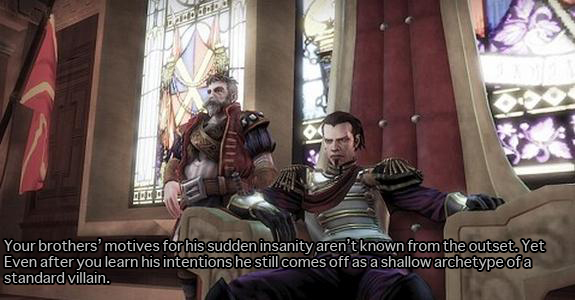 I say "shallow" because Fable 3 is much more linear overall then its predecessors. There is little need to follow the golden breadcrumb trail that shows you your objective since you really can’t explore much at the beginning of the game anyways. Sure because of this you remain focused, but once the game finally opened up I had realized that I hadn’t visited more then half of the actually game. Since the game is so linear you don’t feel the need to engage with the people of Albion outside of a few quest’s and the like. In fact most of the character interactions from previous games are simply done away with. Now all you can do to express yourself are simple actions such as posing or shaking hands with someone. Most of your interactions overall are fairly goofy and just don’t fit the tone of what is played out in the storyline. Like I mentioned before most of the RPG elements have been removed from Fable 3, and I’m just not a big fan of this decision. Early in the game you explore the crypt of your father (who was the hero from Fable 2) and you are given the hero’s amulet. With the amulet you have access to an alternate plane of reality in the game that allows you to progress your characters abilities forward. Want to upgrade your sword, well then just open one of the chests that are located on the “Road to Rule” as its called, and voila! -- you magically become better with a sword. You acquire the necessary points to spend on these skill chests by completing storyline objectives, sidequests, and fighting enemies. The problem is that this system isn’t much of an improvement over a standard leveling system. I don’t feel like my character is actually progressing at all, and because you don’t level abilities in combat there is little reason to fight most enemies. You acquire very little points to spend on the “Road to Rule” by killing enemies in combat, so I found myself just running away! Combat is largely unchanged from Fable 2, so I didn’t really feel like I was missing anything. There are plenty of enemies to fight throughout the main story so random enemy’s are just a chore. The “Road to Rule” seems like a more streamlined way to let newcomers into Fable yet its alienates the more seasoned RPG fans who want to feel like they are the ones progressing their character. The visual and sound design is all solid yet nothing is very noteworthy, aside from some choice voice work. I’m not buying that Fable 3 is the funniest game every made like Peter Molyneux claims but most of the character’s you meet are well written and voiced. One of the more welcomed additions is "The Sanctuary." The clunky menu system from Fable 2 has been removed and instead your are able to physically walk into a secular area that acts in similar fashion. "The Sanctuary" is broken up into different areas that allow you to equip weapons, customize appearance, monitor your achievements, and other tasked that in most games would be restricted to a simple menu system. I like "The Sanctuary"; well it may not be a fast as popping in-and-out of a simple menu system to equip items it's visually pleasing and works surprisingly well. Eventually after you have recruited enough followers to your cause you can overthrow your brother. Once you do so though the real meat of the game opens up. Without going into detail or spoiling the main plot you are tasked with saving the people of Albion from certain disaster. In order to save the people of Albion you most raise over 6 million pieces of gold in order to build an army to stave of this doomsday force. All the promises that you made to the various people that gave you your throne now have to be upheld, sort of! You are able to make good or evil decisions regarding the promises you have made. An example is that in order to pay for Albion’s protection you can drain the local river to mine the minerals located at the bottom, or preserve it for its natural beauty. Some of these decisions are tough especially when two groups that you both want to keep the promises for arrive with their proposals. They decisions you initially make as "Ruler of Albion" were tough for me until you find the flaw in the currency system. Now there isn’t a money exploit like Fable 2. Yet the weight of all the promises you make is dampened by the fact that most are centered around whether or not you have the money to spend. See all you need to do is buy up all the property in the game, raise the prices, and then donate the money back into the treasury. During my playthrough the treasury was always full so promises that I had to keep for the people were easy to make. Just give them whatever they want; I have the money to burn. I just sided with what was considered the good decision when faced with my royal duties and the people of Albion loved me, yet I still had money to protect them in the end. Let me reiterate the end game isn’t broken its just flawed. If the decisions you make don’t carry much weight then there really isn’t much choice. All the choices you are faced with have two outcomes drain the treasury to help the people, or do something evil and gain money. Draining the treasury of funds puts the people of Albion at danger but since you can have so much gold it’s not an issue. Your decisions are no longer tough when you take the need for gold out of the equation! Peter was right Fable 3 isn’t an RPG, its an Adventure game with arbitrary choices sprinkled in at the end. 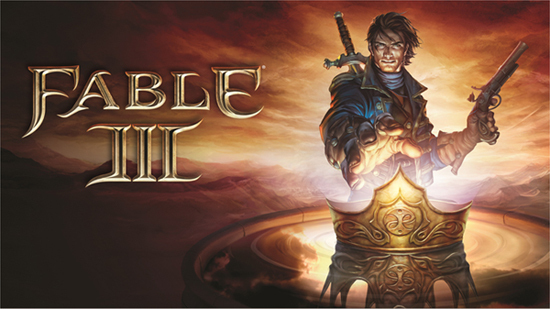 I’ve played this game before, and it was better when it was called Fable 2. Everything in Fable 3 is just a step back from its predecessors in my mind. If you are able to exploit the biggest feature the game has to offer in becoming "Ruler of Albion". Why even make me King or Queen at all, it just seems pointless. Closing Thoughts: Just because you can make a game simpler doesn’t mean you should, the exclusion of most of the RPG elements from Fable doesn't necessarily hurt the game but the "Road to Rule" mechanic isn't a better option. Becoming "Ruler of Albion" seems great on paper but because your big conflict in the game is centered around earning currency, and you have allot of it, this addition falls flat. Becoming "Albion's Ruler" is just plain underdeveloped, and if you haven't played a Fable game before you would be better served with picking up Fable 2 instead. I hope that Peter Molyneux takes a break from Fable because instead of creating the greatest game ever he just seems to always take a step back with each game.